Hutchinson Correctional Facility is located in Reno County Kansas. This prison can house approximately 1,800 adult males. Inmates at this facility can be minimum, medium, maximum and special management custody levels. 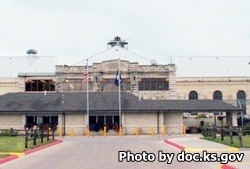 All inmates are housed in the main compound except for the minimum security unit which is located just outside of the walled facility. The medium custody unit is over a mile east of the facility. Depending on which of these units the inmate is housed in, they will have access to different programs. The Central Unit offers vocational skills in plumbing, manufacturing, HVAC, and AutoCad. East Unit offers vocational skills in various building and construction disciplines including carpentry and woodworking. One of the more unique programs offered at the minimum unit of Hutchinson Correctional Facility is the Kansas Wild Horse Program which allows inmates to work with wild horses training them and making them adoptable. Inmates can also participate in a recycling program that recycles a variety of materials. Visitation times will depend on which unit your inmate is housed in. All visits occur on Saturdays and Sundays. Incentive Level I and Maximum Custody may have a three hour visit from up to three visitors at a time Saturdays and Sundays. If the inmates last name is A-L from 8am-11am, last name M-Z from 11:30am-2:30pm. Incentive Levels II and III and all other custody levels may have up to three visitors on Saturdays and Sundays from 8am-2:30pm. Non-Contact Visitations must be scheduled in advance by calling (620)-662-2321 ext. 4317. They can have two visitors at a time and up two one hour visits per weekend. Segregation has video visitation by appointment, contact the unit at (620)-662-2321 ext. 4445. Incentive Level I may have up to five visitors at a time for a three hour duration visit on Saturdays and Sundays. Inmates with last name A-L have visits from 8am-11am, inmates with last name M-Z have visits 11:30am-2:30pm. Incentive Levels II and III have visits on Saturdays and Sundays from 8am-2:30pm. Incentive Level I may have up to five visitors at a time, three hours in duration on Saturdays and Sundays. If the inmates last name starts with A-L they have visits from 8am-11am, and inmates last name M-Z have visits 11:30am-2:30pm. Incentive Level II and III have Saturday and Sunday visits from 8am-2:30pm.